Home Tags Posts tagged with "merle haggard"
Merle Haggard has died of pneumonia on his 79th birthday, his manager confirmed. The singer is credited with helping to define the “Bakersfield sound”, country music with a distinctive twang and lack of sophisticated production. Merle Haggard wrote songs, sang and played fiddle and guitar, usually singing about American pride and outlaws. The country music legend was a member of the Country Music Hall of Fame with dozens of albums and top hits. Merle Haggard, who battled lung cancer in 2008, had recently cancelled April tour dates due to illness and said he hoped to be back on the road in May. Rolling Stone magazine has described him as “the backbone of one of the greatest repertoires an all of American music, plain-spoken songs populated by the kinds of working people Merle Haggard grew up with: farmers, hobos, convicts, widows, musicians and drunks”. 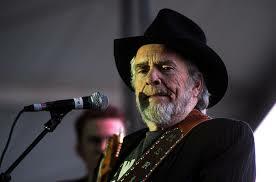 Merle Haggard’s top hits include Mama Tried, The Fugitive, If We Make It Through December and Okie From Muskogee. He was born in California in 1937, living in a converted boxcar with his family and quitting school at a young age to hop freight trains across the south western part of the US. Merle Haggard spent three years in prison for breaking into a cafe while drunk, Rolling Stone notes. Then-governor of California, Ronald Reagan, expunged his criminal record in 1972. Musicians gave their tributes to Merle Haggard on Twitter shortly following the news of his death.